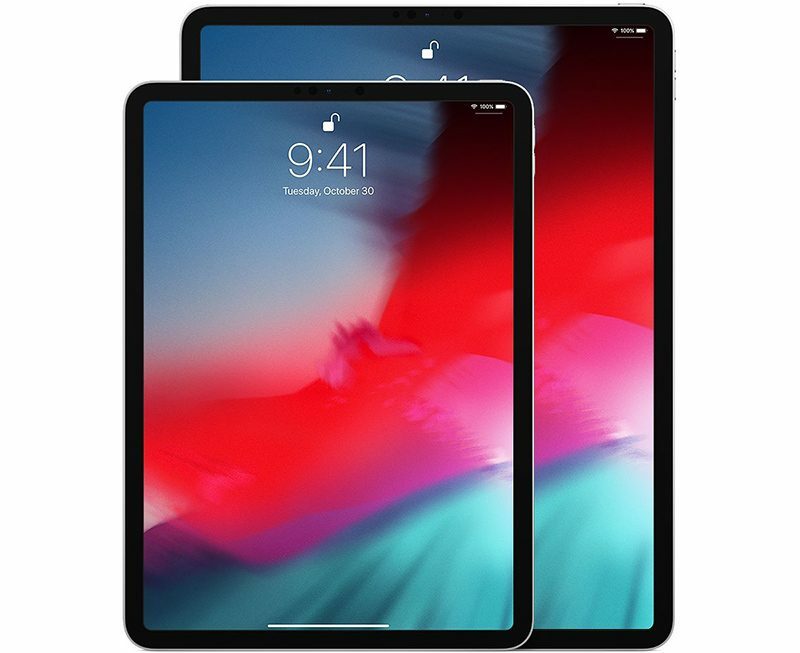 Apple shipped an estimated 14.5 million iPads in the fourth quarter of 2018, according to research firm Strategy Analytics. Apple no longer discloses iPad, iPhone, or Mac unit sales in its earnings reports, leaving us with these estimated figures, which can vary quite significantly between research firms. With the iPhone, for example, estimated shipments have ranged from 65.9 million to 68.4 million to 71.7 million for the quarter. Apple reported sales of 13.2 million iPads in the fourth quarter of 2017, when it was still disclosing unit sales, so the Strategy Analytics data suggests that iPad unit sales have grown nearly 10 percent on a year-over-year basis. Strategy Analytics estimates that the iPad's average selling price was $463, an increase of just over four percent from $445 in the year-ago quarter. This sounds unsurprising, as Apple raised prices with its new iPad Pro lineup in 2018, with the cheapest model starting at $799 compared to $649 in 2017. 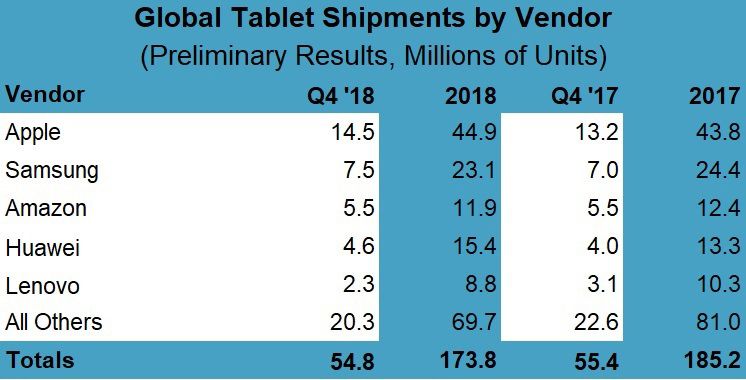 Apple remained the world's most popular tablet vendor, easily topping Samsung's estimated 7.5 million tablet shipments in the quarter, according to Strategy Analytics. Amazon, Huawei, and Lenovo round off the top five with an estimated 5.5 million, 4.6 million, and 2.3 million shipments respectively. On an operating system basis, however, Android tablets from multiple brands still commanded an estimated 60 percent of the market. Apple reported iPad revenue of $6.7 billion in the quarter, a 17 percent increase over the year-ago quarter. Your hypothetical scenario is backed by nothing other than the speculation that they'll "sell more if they lower the price." That doesn't always make the most revenue. Based on the numbers, iPad did phenomenally well, growing at 17% y/y. Absolutely phenomenal and you call it moronic. Thank god you don't own any shares, so you have no say. Apple shareholders love Tim Cook. That's why they voted to keep the board. Get outta here with your facts and your insight! I'm always amazed by the lack of balance on this forum—from Apple fans and critics alike. Personally, I want Apple to lower its prices, but that's because I'm incredibly cheap. From the perspective of the CEO, there might be no incentive to do so. What I want and what's best for Apple's bottom line are two different things. Apple's products aren't best because of the revenue they bring in, and Tim Cook isn't the worst because he maintains high prices. These are two non-conflicting notions that people seem to treat as being mutually exclusive. They could double the sales if they could make it a bit cheaper and significantly increase their revenue on both device sales and service sales. Moronic strategy. Tim Crook should step down. A new iPad is $329. There's likely a new one coming very soon, for probably that price. They're cheaper than ever now. What else do you want? To get an iPad for free? Do you want Tim Cook to give you $100, instead of you paying him? How many got shipped right back? Freaking amazing performance by iPad. Great job. I can’t believe some of you think iPad mentioned in the article is the entry level iPad. It’s all their iPads including iPad Pro! How can the entry level iPad sales price averaged at $460!? It would be nice if Apple still gave us the sales information instead of relying on estimates from research companies. Those days are over. Unless Apple has some amazing number they want to share with us like the 100 billionth one sold or whatever. Apple probably laughs at these analysts numbers. You are being too harsh on tablets great capabilities in this post PC world. Like the iPad, quality product, only as an add on product. It cannot stand on its own. Everyday, literally, I find a webpage form glitch, an incomplete app, or some other incompatibility that I need to get my MacBook to accomplish what the iPad failed to do. This users forum, the post edits like selecting text fails often. I will post something, oops a mistake or better wording needed. Try on iPad’s (we have two) fail. Open Mac, no problem. The Mac I cannot remember ever having an issue. Do I like the iPad, as noted. Best of the tablets on the market, however a bit pricy. Not a standalone product for my needs.